The Maine Credit Union League presented a check for $20,000 to Good Shepherd as part of a $100,000 pledge to help complete a distribution center in Hampden. HAMPDEN, Maine — The Good Shepherd food bank is one step closer to having a fully operational Hampden facility. The Maine Credit Union League presented $20,000 to the food bank today as part of a $100,000 pledge. Good Shepherd bought the building in 2015 and hopes it will be fully operational with cold storage space by the summer. The Hampden facility will serve as a distribution center for food pantries throughout northern, central, and downeast Maine. "We'll have three climate controlled zones and massive freezer space, so that we're able to provide some long term storage for a lot of the fresh produce grown by farmers here in the state of Maine," said Ethan Minton, Good Shepherd Food Bank's major gift officer. 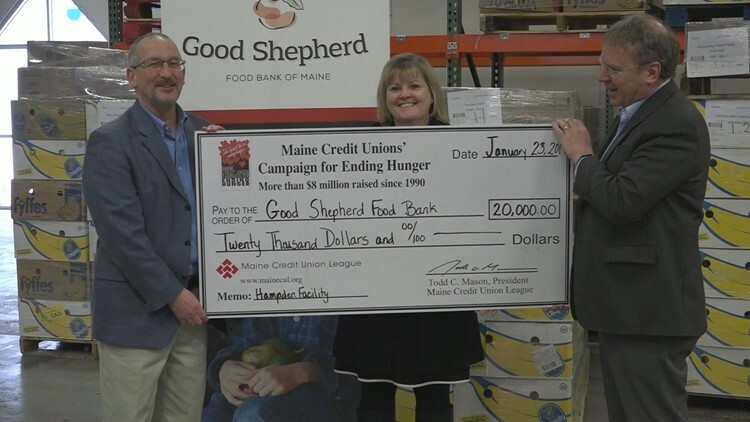 Since 1990, the Maine Credit Unions’ "Campaign for Ending Hunger" has raised more than $8 million and has worked closely with Good Shepherd. "We helped to fund the school backpack program, the school food pantry program, the first food mobile that the Good Shepherd Food Bank had here in Maine, and now the Hampden facility," said Cheryl Lancaster, Executive Vice President of Member Services at the Maine Credit Union League. Once the Good Shepherd Hampden facility is completed, it will be able to distribute an estimated additional 10 million meals per year, on top of the 25 million already distributed annually. With this donation from the Maine Credit Union League, the Good Shepherd Food Pantry is now just over $1 million away from its $5 million fundraising goal to complete the Hampden facility.